Get an unmatched glimpse into life in the Roman Empire with this private tour of the Pompeii and Herculaneum ruins. 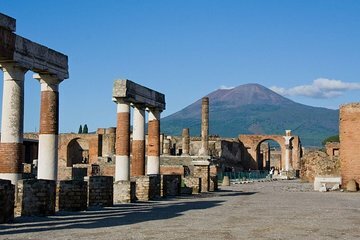 Explore the two cities that thrived more than 2,000 years ago and were remarkably preserved by the ash and debris spewed by Mt Vesuvius in 79 AD. See villas, marketplaces, temples and frescoes while learning about daily life in the cities and their destruction from your private guide. Customize your day with hotel pickup anywhere in the area and a stop for lunch at your choice of a local restaurant or winery. Lucia was a excellent guide and extremely knowledgable. Good sense of humor and simply a pleasure to spend part of our day with. Our driver Umberto took good care of us. We highly recommend both of them, as well as this tour. Lucia, our guide, and her husband, our driver, were both professional and engaging. Having previously visited Pompeii, I assumed that the tour would be redundant. I was both surprised and impressed. Lucia provided us incredible insight into the life of each site. Her language skills are excellent, exceeded only by her knowledge of the subject. Herculaneum was totally amazing - small but such a story and fabulous ruins. This tour was paced well and provided all of us in our group a clear understanding of each site and the life of the people. Well worth the cost of a private tour!